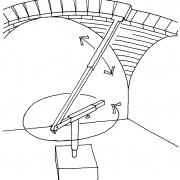 Large, homemade, insulating blocks can be aligned with a simple rotating arm. I realized it would be easy to make giant earthbag scoria blocks with raschel mesh bags, scoria (lightweight lava rock) and quick setting cement mortar or glue. The basic block making process involves forming the scoria blocks in simple wooden forms and then curing in the shade. The dome is built using standard brick dome building methods that brick masons already know or knowledge can be readily found on the Internet and in books. Scoria bags cast into durable blocks create highly insulated, rot proof/insect proof domes suitable for cold and hot climates. This is a simple dome building alternative that anyone with access to lightweight lava rock can do. 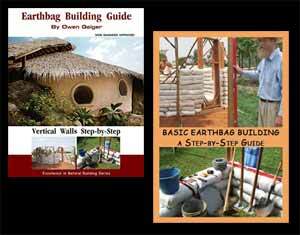 The lightweight blocks are faster and easier to build with than soil-filled earthbags. Scoria bag/scoria block domes require very little if any wood. They’re also highly resistant to hurricane strength winds. Brick domes and vaults are commonly built in Mexico with porous lightweight clay bricks. It would be easy to build domes in a similar manner with homemade earthbag scoria blocks. Simply mix scoria with glue or mortar, fill the bags and lightly tamp in the form. In Mexico the labor is so cheap I recommend hiring some help from experienced dome masons. There are videos on YouTube, etc. that show how to build lightweight brick domes. It’s easy to find information on YouTube by searching for keywords Dome Building and you’ll see numerous videos pop up. Here’s one link to get you started. https://www.youtube.com/watch?v=PB8TWMKHHMQ (This video shows how to build catalan brick vaults but you’ll get the basic idea of how to mortar and set bricks in place. Note how this is a new idea and to my knowledge no one has done this yet. If you decide to build domes like this you’ll want to make some test blocks first to be sure they are stable and determine the optimum size for your project. Please document your project so we can share with others. The housing crisis is very serious, very real, and Kelly and I are devoted to spreading affordable and sustainable building ideas to the world at large. That’s a good way to build straight walled houses. In this article I’m describing a dome/vault building method, including the graceful shapes you see in pictures. This is often called pumice crete. Maybe I should have included that word in the title or article. As explained on our blog many times, scoria and pumice are fireproof, rot proof, lightweight, insulating volcanic materials that do not attract insects or pests. They’re typically sold by landscape suppliers. Use the lightweight type that’s full of air holes.